Our product range includes a wide range of ent video otoscope and video otoscope. When a patient approaches you with an ENT Video Otoscope, he expects a quick and exact diagnosis. MEDICAM helps you to give him that assurance. With our revolutionary VIDEO OTOSCOPE, an innovation that facilitates the thorough investigation, in-depth analysis and efficient management of the patient’s condition. 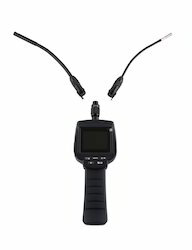 This Video otoscope camera comes with the 2.4-inch screen. This unit has an image freezing and saving facility. It also has Video recording function. The data gets stored in the memory card which can be downloaded on any computer. The probe is fully waterproof. The size of the probe camera is only 3.9 mm which comes with LED illumination. It is a very good portable device with very good user-friendly features. Video otoscope camera comes with the 2.4-inch screen.Ths unit has an image freezing and saving facility. It also has Video recording function. The data gets stored in the memory card which can be downloaded on any computer. The probe is fully waterproof.The size of the probe camera is only 3.9 mm which comes with LED illumination.